Attention horse owners, save on your feed purchases with our Exclusive dog food & Purina Horse Feed Promotion! Your pet deserves great nutrition too. 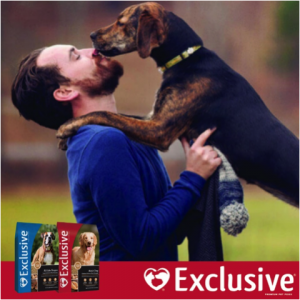 That’s why we’re proud to carry Exclusive® dog foods. Save $8 and a trip during your next visit when you buy Strategy®, Equine Senior® or Impact® horse feed and a 35# bag of Exclusive® dog food. Stop in and ask us for your coupon! Exclusive dog food formulas are thoroughly researched and quality assured for balanced nutrition pets will enjoy. Our blends are inspired by the comforts of home: savory, natural chicken or lamb, hearty flavors and other wholesome hardworking ingredients. We guarantee that you’ll never find unnecessary fillers. Available in puppy, large breed puppy, adult (chicken & rice or lamb & rice formulas), reduced fat adult, large breed adult, senior dog, and performance adult dog food. This entry was posted on Sunday, June 17th, 2018 at 4:19 pm	and is filed under News & Updates, Specials. You can follow any responses to this entry through the RSS 2.0 feed. Responses are currently closed, but you can trackback from your own site.